August 15, 2016, 4:36 p.m. The expansion of grammar schools and academic selection – banned by Tony Blair back in 1997 – could be a prospect once again after it was revealed last week that Theresa May is in favour of bringing them back. Opponents of grammar schools say that they are bad for social mobility, disproportionately taking children from better off families and relegating those left behind to a second class education. This argument doesn’t seem to be shared by the English public, however, which is more divided on the impacts of grammar schools on social mobility. 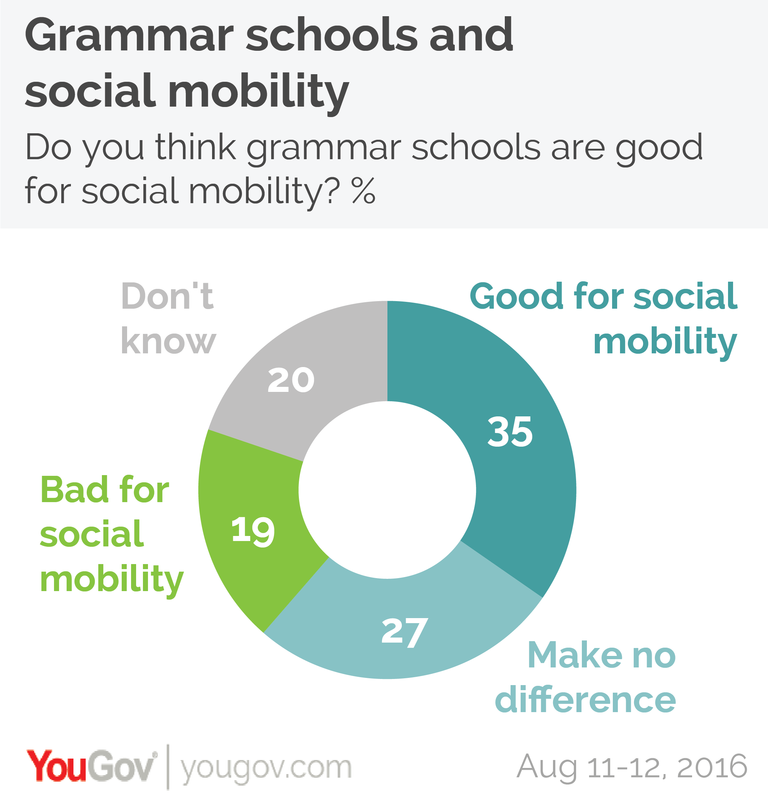 The single most widely held view is that grammars improve social mobility (35%), whilst only 19% think they damage social mobility. A further 27% believe they make no difference at all, and another 20% don’t know. Where a person sends their child to go to school is of course a deeply personal choice, often focused on what is best for the child rather than society at large. Misgivings about social mobility clearly pale in comparison to the perception that grammar schools provide a better education, as nearly two thirds of people (67%) would send their child to a grammar school should they have passed an entrance exam, whilst just 10% would not. Six in ten people (62%) would get their child to sit a grammar school entrance exam whilst 15% would not, implying that 5% of parents would prevent their child from taking the exam on principle, but could not bring themselves to stand in their child’s way should they be accepted by a grammar school. The prospect of actually bringing back grammar schools is supported by a much smaller group of people though. More than a third (38%) of people say they believe that the government should build more grammar schools and encourage more schools to select by academic ability. A quarter (23%) of people support all existing grammar schools being forced to accept children of all abilities, whilst the status quo option of retaining existing grammar schools but not allowing any more was backed by a further 17%. Grammar schools are overwhelmingly favoured by those who attended them, with 61% wanting the government to build more (against 17% who want them all scrapped 14% who favour the status quo), as well as by former private school pupils (54% vs 17% and 16%). Opinion is more split among those who attended Secondary Moderns – the schools which those who were not able to get in to grammar school attended. A third of former pupils of these schools are in favour of more grammar schools, whilst 23% want to scrap the last remaining ones and a further 13% support the status quo. 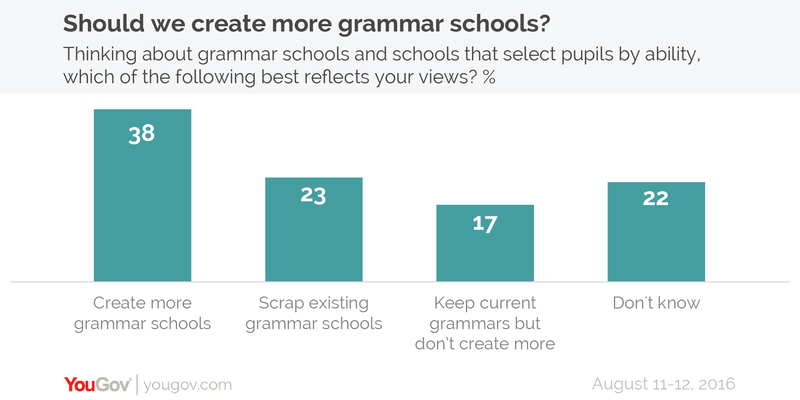 Former students of comprehensive schools are similarly divided although slightly more anti-grammar, with 29% wanting more grammars, 27% wanting to scrap them and 21% supporting the status quo. Politically, grammar schools are the most popular choice of Conservative, UKIP and Lib Dem voters, with 59%, 51% and 38% of those who voted for these parties in 2015 backing more academic selection in schools. Only Labour voters are more likely to oppose them, with 42% wanting to scrap all grammar schools.